Evolution skeptics argue that some biological structures, like the brain or the eye, are simply too complex for natural selection to explain. Biologists have proposed various ways that so-called ‘irreducibly complex’ structures could emerge incrementally over time, bit by bit. But a new study proposes an alternative route. Instead of starting from simpler precursors and becoming more intricate, say authors Dan McShea and Wim Hordijk, some structures could have evolved from complex beginnings that gradually grew simpler — an idea they dub “complexity by subtraction.” Computer models and trends in skull evolution back them up, the researchers show in a study published this week in the journal Evolutionary Biology. Some biological structures are too dizzyingly complex to have emerged stepwise by adding one part and then the next over time, intelligent design advocates say. Consider the human eye, or the cascade that causes blood to clot, or the flagellum, the tiny appendage that enables some bacteria to get around. Such all-or-none structures, the argument goes, need all their parts in order to function. Alter or take away any one piece, and the whole system stops working. In other words, what good is two thirds of an eye, or half of a flagellum? For the majority of scientists, the standard response is to point to simpler versions of supposedly ‘irreducibly complex’ structures that exist in nature today, such as cup eyes in flatworms. Others show how such structures could have evolved incrementally over millions of years from simpler precursors. A simple eye-like structure — say, a patch of light-sensitive cells on the surface of the skin — could evolve into a camera-like eye like what we humans and many other animals have today, biologists say. 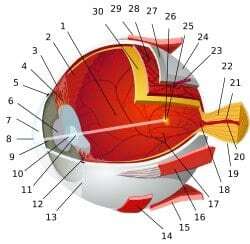 “Even a very simple eye with a small number of parts would work a little. It would be able to detect shadows, or where light is coming from,” said co-author Dan McShea of Duke University. “Instead of building up bit by bit from simple to complex, you start complex and then winnow out the unnecessary parts, refining them and making them more efficient as you go,” McShea said. A computer model used by co-author Wim Hordijk supports the idea. In the model, complex structures are represented by an array of cells, some white and some black, like the squares of a checkerboard. In this class of models known as cellular automata, the cells can change between black and white according to a set of rules. Using a computer program that mimics the process of inheritance, mutation, recombination, and reproduction, the cells were then asked to perform a certain task. The better they were at accomplishing the task, the more likely they were to get passed on to the next generation, and over time a new generation of rules replaced the old ones. In the beginning, the patterns of black and white cells that emerged were quite complex. But after several more generations, some rules ‘evolved’ to generate simpler black and white cell patterns, and became more efficient at performing the task, Hordijk said. We see similar trends in nature too, the authors say. Summarizing the results of previous paleontological studies, they show that vertebrate skulls started out complex, but have grown simpler and more streamlined. “For example, the skulls of fossil fish consist of a large number of differently-shaped bones that cover the skull like a jigsaw puzzle,” McShea said. “We see a reduction in the number of skull bone types in the evolutionary transitions from fish to amphibian to reptile to mammal.” In some cases skull bones were lost; in other cases adjacent bones were fused. Human skulls, for example, have fewer bones than fish skulls. Computer simulations like Hordijk’s will allow scientists to test ideas about how often ‘complexity by subtraction’ happens, or how long it takes. The next step is to find out how often the phenomenon happens in nature. “What we need to do next is pick an arbitrary sample of complex structures and trace their evolution and see if you can tell which route they proceeded by, [from simple to complex or the opposite]. That will tell us whether this is common or not,” McShea added. Previous articleHorse poop key to streamlining biofuel production? I am in urgent need of a new BS detector. Also, I can hardly wait on PZ Myers completely demolishing this craziness.